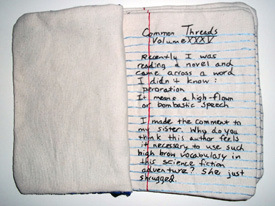 Common Threads is a series of hand-embroidered canvas books, copy the form and design of dime store “composition” books. The books themselves, self consciously hand made objects, are a record of coincidental occurrences generally gleaned from reading or mundane events. The use of embroidery thread allows for the production of the text and image with the same mark and material, to make the text, image and substance of the book inseparable. Candace Hicks is the Coordinator of Foundations at Stephen F. Austin State University where she teaches foundational courses in two-dimensional media. She holds a Bachelor of Arts degree from Austin College where she studied drawing, painting, and French. She lived in France for two years and speaks French fluently. In 2009 she earned a Master of Fine Art degree in Printmaking from Texas Christian University. 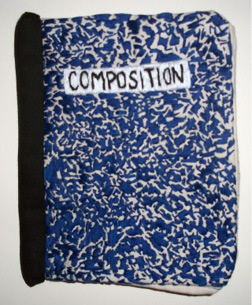 Her work consists of artist’s books, video, performance, printmaking and drawing.